Time for the Rs 100 note to get a makeover now. 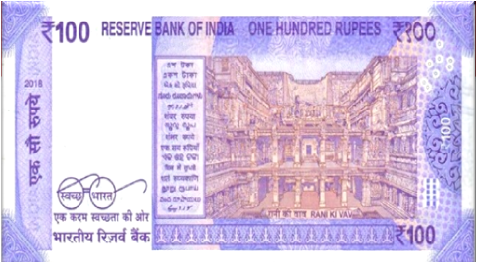 The Reserve Bank of India (RBI) is going to issue a new Rs 100 denomination banknote in the Mahatma Gandhi (New) Series and bear the signature of Governor Urjit Patel, which would have lavender colour as base. 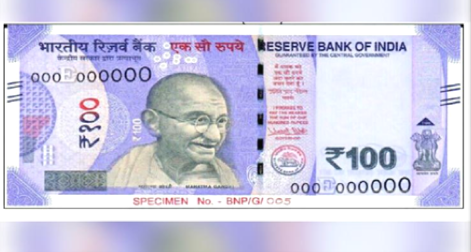 The back of the note will have denominational numeral 100 in Devnagari. The dimension of the new note will be 66 mm × 142 mm, which will be the same as the other new notes released last year. While the front side depicts Mahatma Gandhi’s face, the back side will feature a motif of “RANI KI VAV”, highlighting the country’s cultural heritage. RANI KI VAV refers to a memorial constructed in Patan, Gujarat for the 11th century king Bhima. In August 2017, new Rs 50 and Rs 200 notes were introduced in the Mahatma Gandhi series. In order to get rid of counterfeiting and promote a less-cash economy, the move to reintroduce lower denomination notes in a new design was made. See-through register and latent image with denominational numeral 100. Like every other currency note, this note also has a portrait of Mahatma Gandhi at the centre. There is a security thread with inscriptions, ‘भारत’ and RBI, and if the note is tilted, the colour changes from green to blue. Ashoka Pillar emblem on the right. The top left side and bottom right side have a number panel with numerals in ascending font. Certain features have been incorporated for the visually impaired. These include: intaglio or raised printing of Mahatma Gandhi portrait, Ashoka Pillar emblem, raised triangular identification mark with micro-text 100, four angular bleed lines on the right and left sides. On November 8, 2017, Prime Minister Narendra Modi announced that on the stroke of midnight, all 500 and 1,000 rupee notes - 86 per cent of the currency in circulation - would cease to become legal tender. Up to that point, upwards of 95 per cent of all transactions in India were conducted in cash and 90 per cent of vendors didn't have the means to accept anything. On top of this, 85 per cent of workers were paid exclusively in cash and almost half of the population didn't even have bank accounts. The RBI said in its Annual Report for 2016-17 that 99 per cent of the junked Rs 500 and 1,000 notes were returned to the banking system. This led many, including Opposition leaders, questioning the very logic of demonetisation.